RODANTHE, N.C. -- Arthur strengthened into a Category 2 hurricane with winds increasing to 100 mph on Thursday night as it threatened to strike near the North Carolina coast on Independence Day. Thousands of vacationers and residents fled parts of the state's popular but flood-prone Outer Banks, and Fourth of July celebrations up and down the East Coast were postponed or faced the threat of cancelation. The U.S. National Hurricane Center said little additional change in strength was expected Thursday night and Friday and that the storm would begin weakening Friday night. On Thursday night, Arthur was located about 55 miles northeast of Cape Fear, North Carolina, and about 110 miles southwest of Cape Hatteras, North Carolina. It was moving northeast at 15 mph. In the Outer Banks, Nichole Specht, 27, and Ryan Witman, 28, left Hatteras Island at 3:30 a.m. Thursday, beating the expected traffic jam. The island was under an evacuation order, with no traffic allowed in. Officials asked an estimated 35,000 residents and travelers to leave through North Carolina Route 12, the only road on and off Hatteras. Specht and Witman found the road wide open for their return home to Lancaster, Pennsylvania. Specht said her parents left their rental later, at 5 a.m., and also found clear sailing. "We were just saying we were really, really lucky this year that the weather was so great, and then this," Specht said as she ended a two-week vacation that included scouting sites for the couple's wedding next year. According to CBS affiliate WRAL, New Hanover County and the City of Wilmington declared a state of emergency effective on Thursday morning. The North Carolina ferry system shut down the Ocracoke-Hatteras route at 5 p.m. Thursday. Forecasters expect Arthur to pass over or near the Outer Banks - a 200-mile string of narrow barrier islands with about 57,000 permanent residents - early Friday, bringing rain, heavy winds, storm surge and dangerous rip tides. "We don't know for sure if the exact center of Arthur is going to pass over land or not. The chances have been increasing for that to occur with the last couple of forecasts. But even if the exact center doesn't go over you, you will experience impacts tonight. The weather is going downhill in North Carolina, even as we speak," said Rick Knabb, the director of the U.S. National Hurricane Center in Miami. Before the storm hit, tourism officials had expected 250,000 people to travel to the Outer Banks for the holiday weekend. Gov. Pat McCrory warned people: "Don't put your stupid hat on," urging them to put safety before picnics, barbecues and pre-paid beach cottage vacations. But some visitors stayed put, hopeful the fast-moving storm would follow predictions to pass through Friday and salvage the rest of the weekend. About 20 miles north of the only bridge off Hatteras, Sean Fitzgerald and his 5-year-old son, Cade, enjoyed a sunny morning lounging in beach chairs in the town of Kill Devil Hills. The sand was dotted with tourists. A handful of surfers took to the water. Like all areas north of Oregon Inlet, Kill Devils Hills wasn't under an evacuation. Fitzgerald said he saw no need to disrupt his family's vacation. "I plan to sit on the beach as long as the sun is here," then head out for a seafood dinner, said Fitzgerald, 44, of Fairfax, Virginia. Those who don't evacuate should prepare for possibly getting stuck for several days without food, water or power, National Hurricane Center forecaster Stacy Stewart said Thursday. "We want the public to take this system very seriously, go ahead and start their preparations because time is beginning to run out," he said. The holiday weekend was not expected to be a complete loss on the Outer Banks. Forecasters said Arthur, the first named storm of the 2014 Atlantic hurricane season, would move through quickly with the worst of the weather near Cape Hatteras about dawn Friday. Then it was expected to clear. 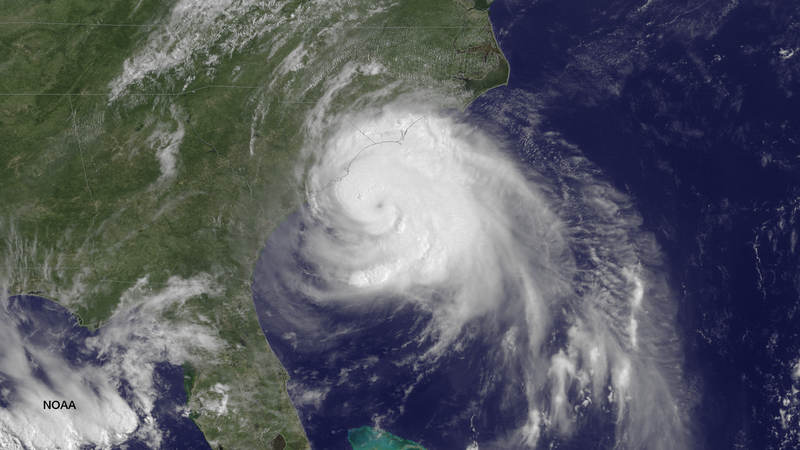 The National Hurricane Center predicted Arthur would start to weaken Friday night. Farther north, the annual Boston Pops Fourth of July concert and fireworks show was moved up a day to Thursday night because of potential heavy rain on Friday. Several other communities in New England postponed or moved up their fireworks displays as well. If Arthur makes landfall in the U.S. on Friday, it would be the first hurricane to do so on the Fourth of July, according to National Hurricane Center research that goes back to the 1850s.